The official Tournament Team Line-up Cards (Excel version) is provided for your convenience. It can easily be downloaded, updated, and printed prior to the game. 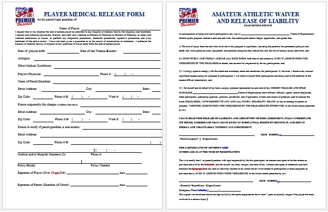 Sample USA Premier Baseball Player Medical & Liability Release Form (MS Word version) is provided for your convenience. It can easily be downloaded, updated, and printed for your records. It is the responsibility of all coaches to have signed agreements from all players with them at any USA Premier Baseball games. The official USA Premier Baseball League Contracts and Medical Release (MS Word version) is provided for your convenience. It can easily be downloaded, updated, and printed for your records.